The Hermit Crab Garden ~ CLEARANCE! Re: The Hermit Crab Garden ~ New Flowers are Ready! Yep. Mealworms. Lol. I have bloodworms for them that I bought separately. I can't keep the proteins straight. Mealworms and blood worms and shrimp, oh my!! I ordered the colony box today. Can't wait! You got the last one! I'll have it in the mail tomorrow. That's wonderful!!! My crabs are going to be soooooooo happy! wodesorel wrote: Shipping weight is 3 lbs, so minus the box it's at least 2lb 10ounces of goodies. Without the bag of maple and oak leaves and packed tightly, it completely fills a 6x6x6 box so it is a large amount of food. Okay, so I completely forgot about the bag of frozen stuff when I tallied that up. All together it was nearly 4 pounds shipping weight and was over 3.5 pounds of just the goodies by themselves. Completely filled a giant shoe-box sized mailing box. There will be more colony boxes in the future, but we have to wait on the garden! wodesorel wrote: Okay, so I completely forgot about the bag of frozen stuff when I tallied that up. All together it was nearly 4 pounds shipping weight and was over 3.5 pounds of just the goodies by themselves. Completely filled a giant shoe-box sized mailing box. The anticipation is going to drive me crazy!!! Let me know if the shipping is higher because of the frozen goodies! The colony box is AMAZING!!! Thanks Wode! How long do you think your dried flowers will be selling for? I wanted to make an order but maybe a bit later in the season...any chance they'll still be around or do you not have too much right now?? I'm still getting the hang of stock levels, especially since this will be the first full year the store front will be open (prior to this I did mostly variety boxes in winter) but I am very comfortable with the amount of Dandelions and Lilacs we have and they should last through the summer easily. I've been on a mad drying spree! Violets however there are only a few since an entire tray dries down to a single bag, but I'm hoping to be able to continue drying those throughout the summer as they keep blooming. Marigolds should be ready in about month, less if we get good weather. I'm planning on Pansies and and my favorite heirloom scented Petunias as well for later this summer but I won't even hazard a guess on when or how much they'll produce until they get settled in and get started blooming. There is a full seed tray of Amaranth sprouts on the front porch that will (with all luck) be ready for transplanting next weekend. And of course the blue Rose of Sharons that start blooming much later around August. Knowing more about the timing of when things are ready and how popular certain items, I've gone a bit more flower-heavy in my garden plans this year to try to make sure we don't run out again! Are you still shipping roaches? When do you stop shipping? I may be interested in some Halloween Hissers next month if you still ship then and have any available to ship. Amazilia wrote: Are you still shipping roaches? When do you stop shipping? I may be interested in some Halloween Hissers next month if you still ship then and have any available to ship. I haven't even got them listed yet - still sorting through and figuring out how many are there. Should have photos and prices up by the end of this week and there will be Halloweens! Very handy site, I will bookmark it. One thing I would recommend though, is to have a page or whatnot of what you CAN get, but is not available right now, so if the person is looking for something in particular (like oak leaves, carnations, etc), they can see you will have it, just not right now. We're back! Sorry about the delay, we lost all the photos when we upgraded and it took forever to track down all the originals. There are going to be broken links to my photos everywhere on the HCA, and I'm still working on finding all of those, and getting the photo galleries back up on my site. Update on Canadian orders: I found a better resource to check the legality of sending stuff over the border and have made changes according to those lists. I'm sorry! I wish the whole process was easier. Some things are now available that weren't before, like dried mosses, but some things I'll no longer send, like sorghum items. I do not want trouble with customs, so when in doubt it can't be sent. Axiluvia - love that idea! Before all this craziness I had been half-seriously working on a glossary of sorts since we sell some unique items and not everyone knows what they are. (Salsify, anyone?) I think a listing of what we've had in the past and are expecting to have in the future, along with a little blurb about what they are, might be worth it. 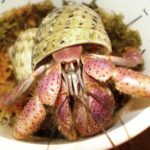 Re: The Hermit Crab Garden ~ We're back! With new items! Tiny hiccup with the relaunch - will be fixing it in the morning, until then the site is down! Which shipped really fast btw! Tried the site and it was still down. Can't wait to check it out! I've ran out of my last order and need to get some more stuff! 1 very awesome, understanding husband. kib13 - if everything keeps going smoothly, we should be up by tomorrow night. Most of the waiting is due to file transfers, and because the hosting company needed to reset everything so that we could reinstall Wordpress. Once the files are all back in place then I can get in there, replace the custom coding, do some testing, and go live again. I've been staring at FTP transfer screens all day.... it's sort of like watching grass grow.